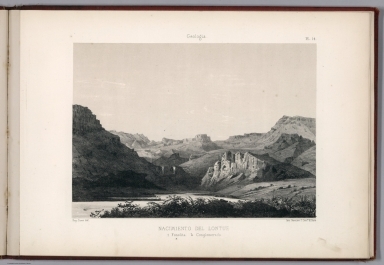 "Engraved view of the Lontue River, flows initially northwest across the Andes. 1875 edition of Geografia fisica de la Republica de Chile, includes an atlas: Atlas de la Geografia fisica de la Republica de Chile. Text: 22 x14 in 536 pages (Page 356 incorrectly numbered 536), with ""Pissis -- Geografia fisica de la Republica de Chile"" on spine in gilt. In this work he describes in detail the Chilean terrain, comparing it with other South American countries. It also refers to geological formations and meteorology, details the hydrographic basins from Copiapo to Reloncavi, and finally, botanical geography and national fauna. On recto of title page: Corbeil. - Imprenta de Crete Hijo. Atlas: 31x44, includes index,14 sheets of views, some color, 1 table and 7 profiles, with title ""Pissis -- ""Atlas de la geografia fisica de la Republica de Chile"" in gilt on spine. Both volumes bound in red hard covers with vignette of coat of arms of Chile on front cover. Pierre Joseph Aimé Pissis (in Spanish Pedro José Amadeo Pissis), was a French geologist who studied at the School of Mines, the Polytechnic and at the Museum of Natural History in Paris. He carried out geological and mineralogical works in Brazil and Bolivia, then he moved to Chile. In this work he spent 20 years, Between 1848 and 1868, toured the country, emphasizing his recognition of the Atacama Desert. In 1875 he published in Paris his most important work, Physical Geography of the Republic of Chile." Cover: Mapa de la Republica de Chile.